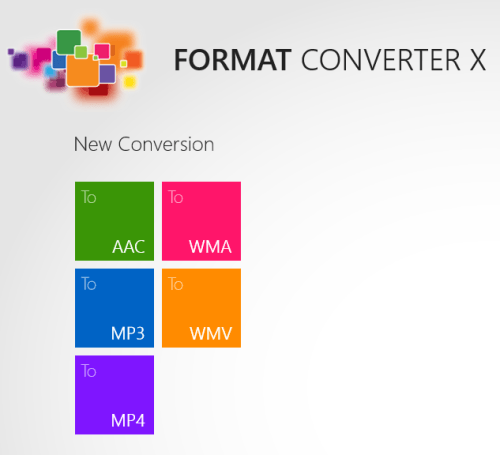 Format Converter X is a Windows 8 media converter app that lets you convert audio and video files in different file formats. You can easily locate it under ‘Tools’ section of Windows Store. At present, this Windows 8 media converter app supports conversion of files in MP4, WMV, AC3, MP3, WMA, AVI, AAC, MPG, MPEG, WAV, M4V, MOV, PCM, or M4A format to MP4, MP3, WMV, WMA, AAC file formats. This light weight free online application is 100% free with no strings attached. The make just makes it easy for you to convert your media files on your Windows 8 desktop. On launching this Windows 8 media converter app, you will be presented with the following interface. There, you will see few colorful buttons with names of different file formats. Click on the format button in which you want to convert the Video/Audio. Soon after that you will be redirected to explorer for selecting the file to be converted. Just select the file and click on “Open” button. (Only the files in supported formats will be visible). Next, you will be redirected back to the application Window. At last, you will need to click on ‘Convert’ button as in the screenshot above. Also, you have the option to change format and the quality before clicking on ‘Convert’ button. Then the processing will begin and will complete in a short span of time. * You can utilize Windows 8 media converter app as per requirement. Anyhow, it may fail in converting large files. Also, check out our posts on Unit Converter Apps, BMI Calculator Apps, and Image Resizing Apps. To install Format Converter X app, open this link in IE10 or advance. On the webpage Click on ‘View in Windows Store’ button to open the app in Windows 8 Store. Now, you can click on ‘Install’ button to download the app. * The app is only 705 KB in size and works better while using the mouse wheel. 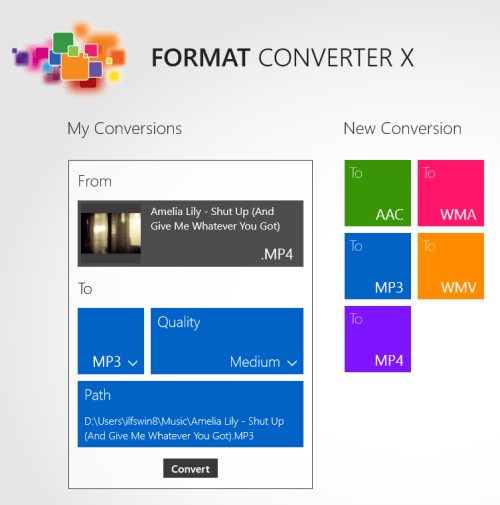 Format Converter X Windows 8 media converter app is definitely a nice option for you to try. It’s good and likely to become better in coming days. Also, you might be interested in checking these Lightweight Windows 8 Video Player Apps.